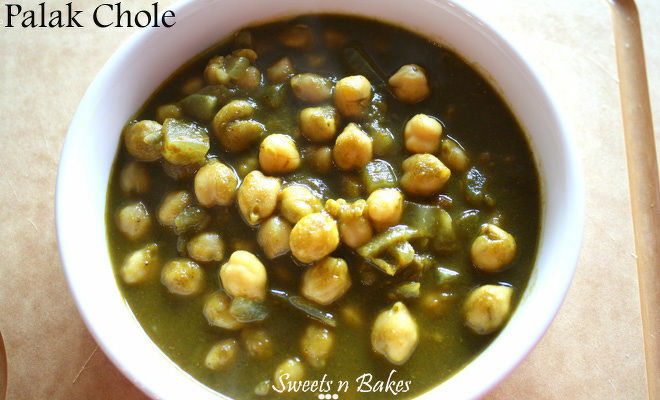 Spinach (Palak) and Chole (Chickpeas) are a super healthy combination. Chickpeas are rich in proteins and spinach is one of the healthiest foods that you can eat. 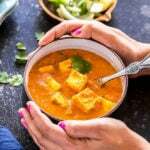 In fact Chickpeas are one of the best sources of proteins for vegetarians. I had this bunch of fresh Spinach lying in my fridge, doesn’t it look beautiful? 🙂 and so I thought of making Palak-Chole today. 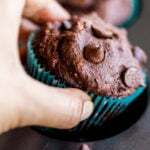 The recipe is simple and easy to make. 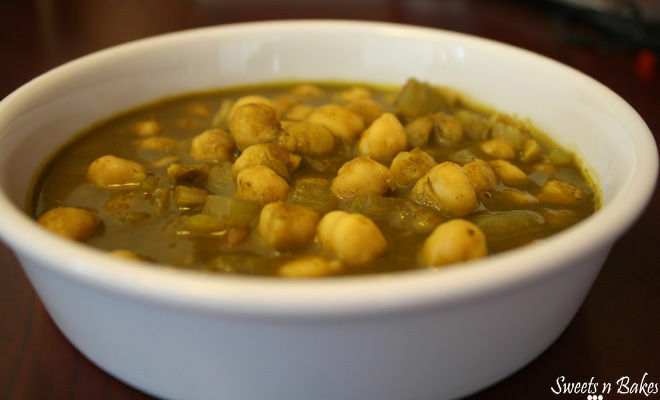 Chickpeas are first boiled and then cooked in a spinach gravy with spices. 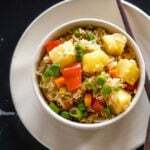 I have used onion and tomatoes in the recipe but you can use either or none. 1. Soak the chickpeas overnight. 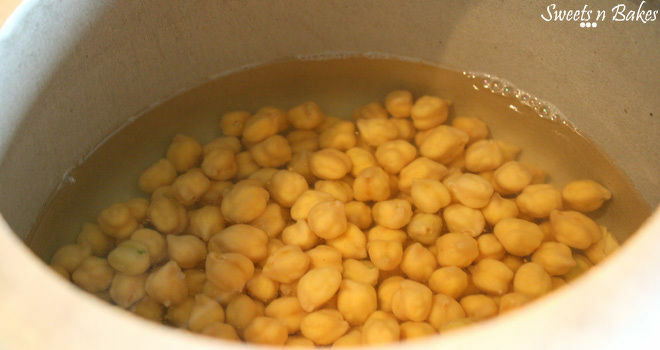 You can cut short this method by using canned chickpeas however I prefer the traditional method of soaking and then boiling them in pressure cooker. Put enough water to cover the chickpeas, add some salt and close the lid of the cooker. Let it whistle 2-3 times and then lower the heat to low-medium and let it cook for 5-7 minutes more. Switch off the flame, you chickpeas are now ready to go into the gravy. 2. Next step is to puree the spinach. 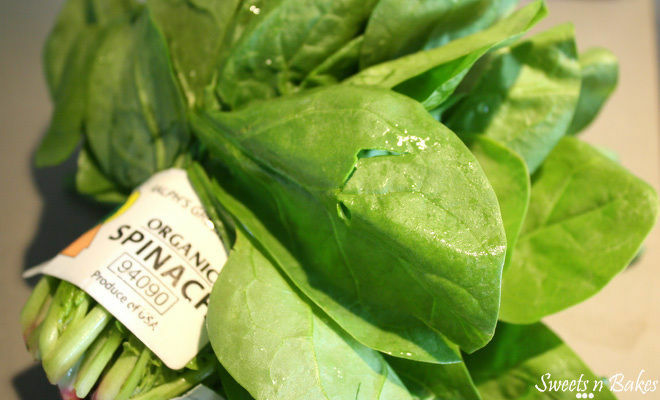 Blanch the spinach first by cooking it in a pan with 1-2 tbsp of water. The leaves will blanch in 3-4 minutes. Remove them from the pan and put them in cold water. This way we refresh the spinach leaves which helps in retaining the green color. 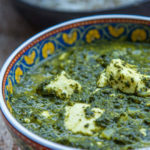 Puree the spinach into a fine paste using a blender. 3. Put oil in the pan and once the oil is hot, put cloves and cinnamon stick into it. Next put in the chopped garlic. Now I love garlic but in case you aren’t too fond of it’s smell, you can easily skip it. Fry the garlic till light brown making sure it doesn’t burn. Now add the chopped onions and cook till they are light golden brown in color. 4. Puree the tomato and green chillies in a blender and add the tomato paste into the pan. Let the tomatoes cook for around 4-5 minutes or till oil starts separating from the mixture. Now add in the spinach puree which we had prepared earlier. 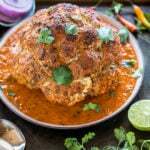 Also add the coriander powder, salt, garam masala and turmeric powder at this point. Cook for 1-2 minutes and add in the chole. 5. You can now add either milk or water, cover the pan and let it simmer at medium-low for 10 minutes. Adding water or milk is optional, I added milk [and that’s why the green of the spinach looks dull in the final picture] because I wanted this dish to have a good gravy. In case you don’t want that just let the chickpeas cook with the spinach puree alone. 6. 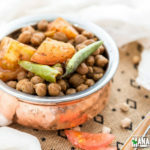 Sprinkle chole masala and lemon juice and switch off the flame. 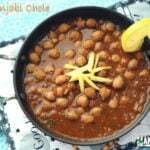 Palak Chole is ready to serve either with rice or roti.